For the new year, I decided to make a goal for positivity rather than make a resolution (which usually get broken anyway). You can read about that here. It took ma a little bit of time to find a jar that I liked. 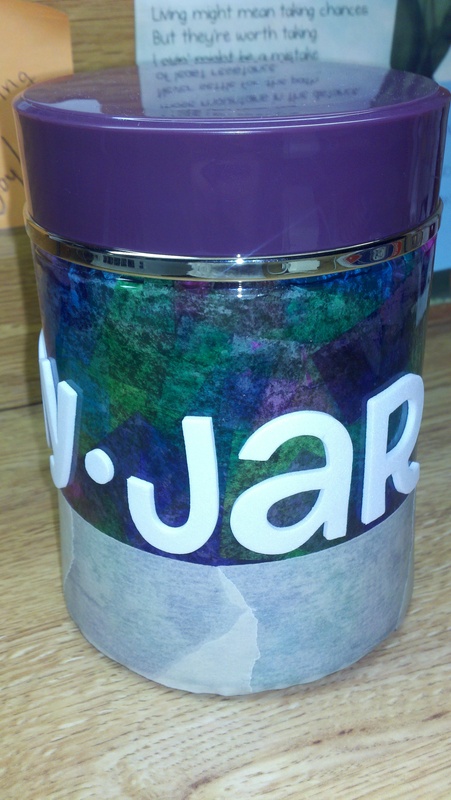 Once I found my jar at target (and on sale! ), I needed some inspiration for how to decorate it. After some thought, my roommate suggested that I mod podge some tissue paper on it. I like the idea a lot so I took it and ran! In the end, I went with cool colors for some cohesion. 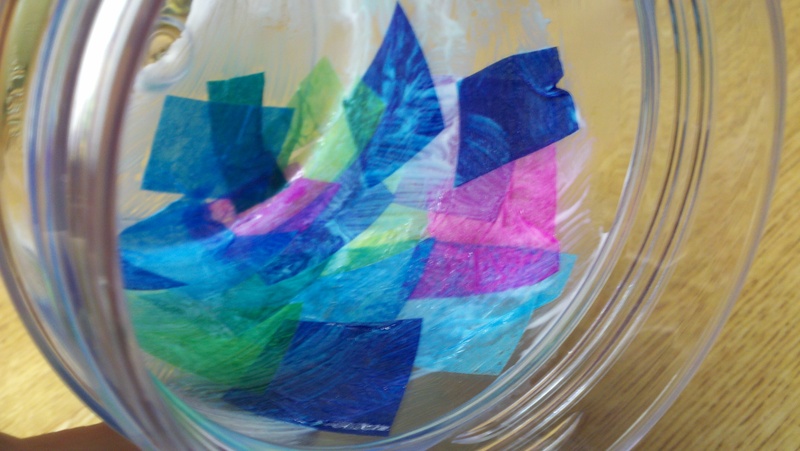 Also, the lid of the jar is purple, so I thought I would stay in that family rather than doing warm colored tissue or multicolored tissue. 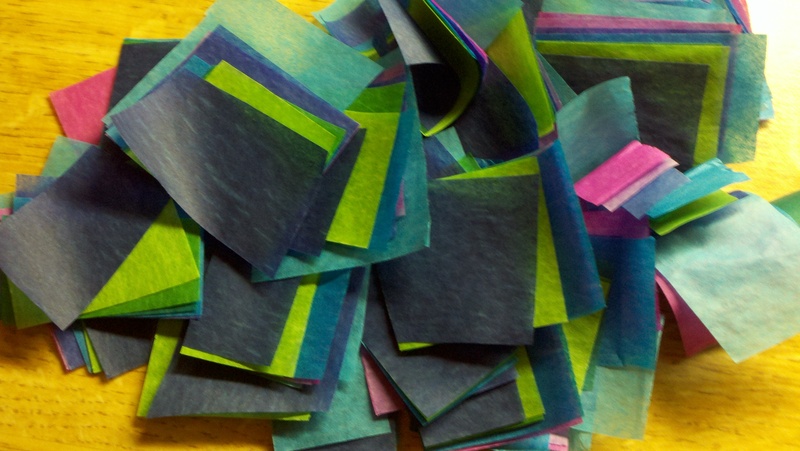 I first cut strips from the end of the cool colors in the pack. This way I just cut a few inches off each one and can use them as tissue paper later on if I want to. 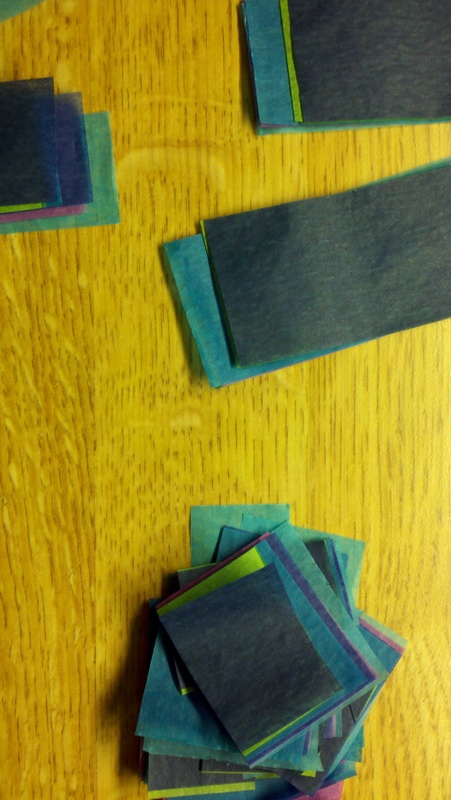 Then I cut the strips into smaller strips, and those smaller strips into small, various sized rectangles. I pushed all the paper into one pile and tried to mix it up a little before beginning. 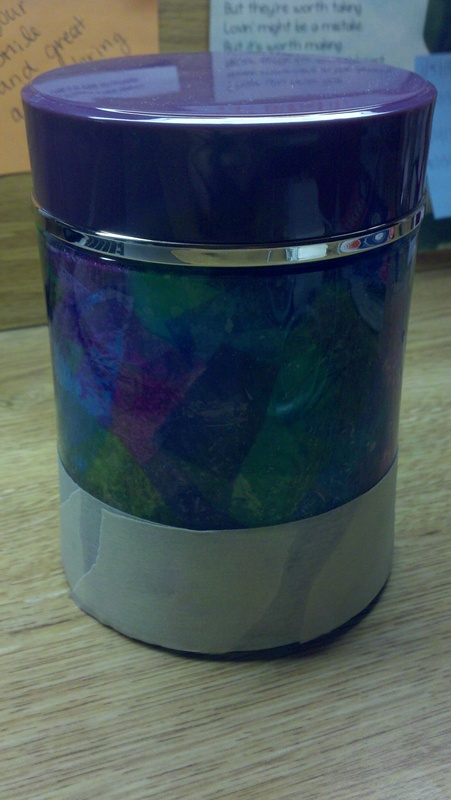 I chose to put my tissue on the inside of my jar so that the outside would stay nice and smooth and there was less of a chance some would start to peel off due to being rubbed up against other things. From there I just put a layer of mod podge down on the inside of the jar and placed the tissue pieces over that are in a random pattern. 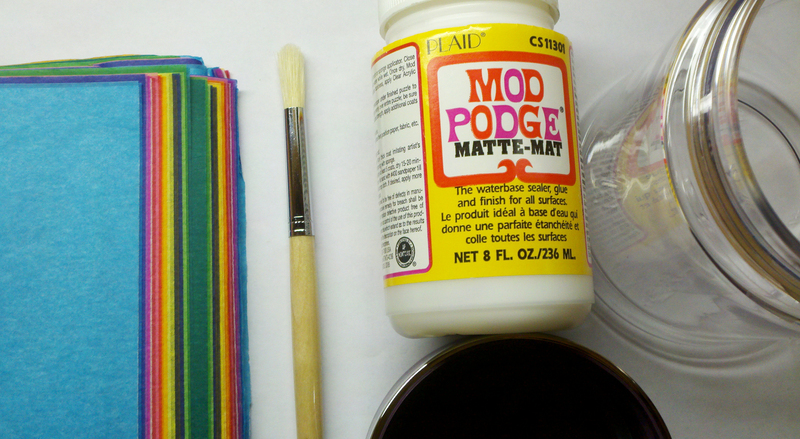 To seal the tissue, I put another layer of mod podge over the tissue once it was down. I also put tissue on the bottom and the lip of the jar. 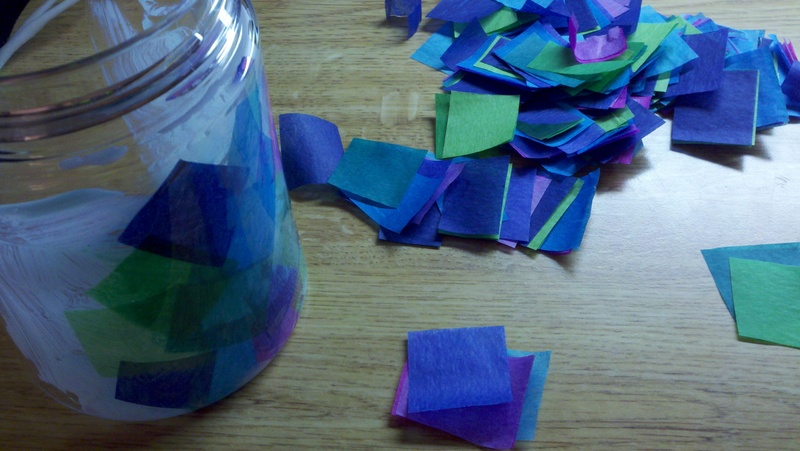 I knew that I wanted to write something on the outside to spell out what the jar was for. 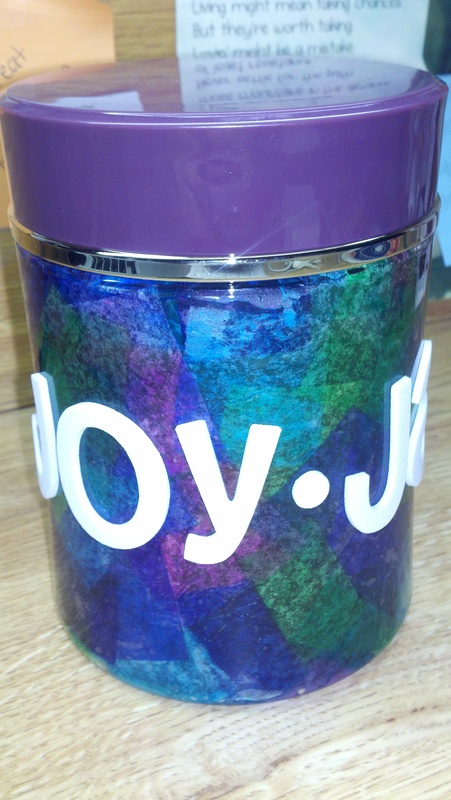 It took me a while, but I finally landed on joy jar. I thought this was the most descriptive title I could put while keeping it short and simple. I am putting little stories of joyful days in it after all… Once I landed on what to call it, I got some letter stickers. I knew that I wanted bigger stickers, and I knew I wanted the to be simple and white (so they would pop out from the dark jar). When I finally got to putting the stickers on, I put masking tape around the bottom of the jar to mark the level I wanted the stickers at and to keep my words straight. I had to use smaller pieces because I jar curves in a little. I just placed my stickers in order around the jar. I also added a dot in between joy and jar to give it some character. The last thing I did was take the masking tape off. Here is the final product. 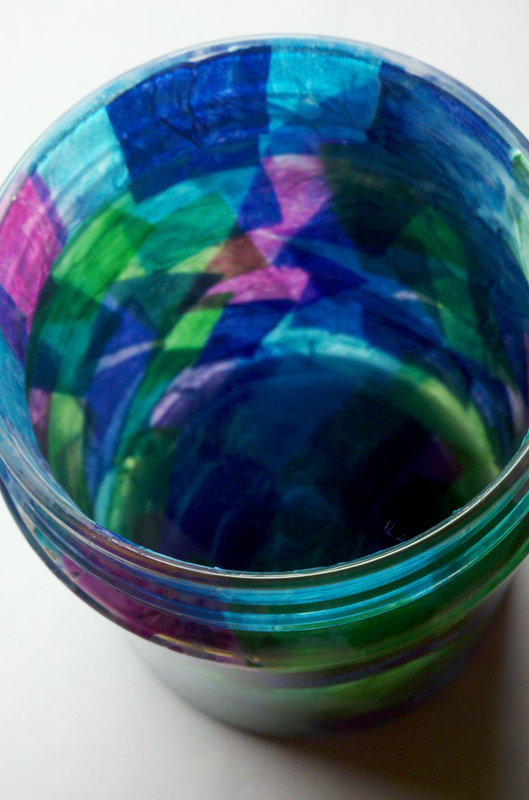 I love how my jar turned out!